Lake Hitchcock spanned much of the current Connecticut Valley. Farmers don’t have much time to go to the beach (unless it’s biking to Puffer’s Pond!) during the summer, but we know that life is a beach at Simple Gifts Farm. In fact, the farm really is along the shore – that is, if you were to transport back in time about 15,000-12,000 years ago. Back then, the last ice age was ending, and the glaciers were in retreat. The Connecticut Valley formed the basin of the brilliantly blue Glacial Lake Hitchcock. At its maximum, this lake stretched from the dam at Rocky Hill, Connecticut, all the way north to St. Johnsbury, Vermont (find out more here). The water level fluctuated, but it appears that the farm progresses into the lake from the shore from east to west. The west end of the farm by North Pleasant Street has finer-textured soils, including some clays. The field visible from Pine Street is closer to the shoreline, and the soils have a gravelly to sandy texture. Our house, or perhaps the woods behind our house, is on a one-time beach, delta or sandbar. Indeed, when we had the foundation dug for our house in 2006, our kids were smitten with the sandbox-quality sand in the hole. As you continue east down Pine Street its intersection with Sand Hill Road (there’s a reason for that name! ), you’ll be traveling by a river outlet with a delta formation. The current Mill River is what remains of this once-larger stream and delta. This includes the Town sand/gravel pit just east of the farm. We are inland (east) from the world-famous Hadley silt loams, formed from fine-textured lake bottom deposits and more recent river deposits. Those soils are amazingly rich and fertile. The soils of our farm are dominated by Hinckley loamy sand. These are more coarse-textured than the Hadley loam, and a major challenge is that these sandy-gravelly soils do not hold nutrients or water well. These soils are fine for agriculture when they overlay level ground, as they do here, but we have to work hard to supply the crops with sufficient fertility. Rain percolates quickly through the coarse soil, and we need to constantly correct soil fertility with targeted applications that the crops can take up quickly before they wash down through the soil profile. In addition to strengthening long-term nutrient holding capacity by building organic matter via pasture rotations and incorporating cover crops and compost, we add organic nutrients into our drip irrigation, and apply foliar sprays. On the plus side, the rapidly drying soil allows us to prepare fields for planting earlier in the season, and we can ride through extremely wet years – like the one we’ve had so far this season – better than a farm with wetter soils. In addition, although it takes more work to continually adjust the fertility balance, it is relatively easier to correct imbalances than on soils that retain everything strongly. We like our shoreline location, and knowing about the geology of the farm improves both our daily management and our appreciation of this place on earth. A killdeer shows its famous broken wing display. Who jeers at hard-working farmers and thinks living at the farm is just a life at the beach? Killdeer, of course! While the rest of its kin are shorebirds, these inland members of the plover family thrive in farm fields and wide-open areas. Often seen running in starts and stops across the field, or circling overhead, these noisy birds brighten our days. 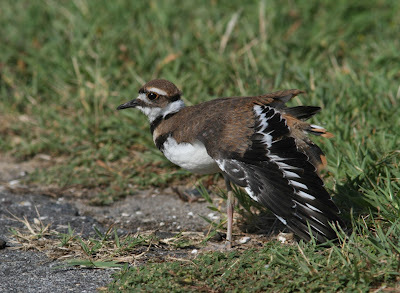 Killdeer (Charaduis vociferous) are named for their loud, repeated call of kill-deeah. Their vocal repertoire also includes a rising dee-ee and low trills. By sight, they can be identified by their handsome black double breastband (chicks have one band) and the white wing stripe that is visible in when the bird is in flight. The farm is an ecosystem designed by and for humans, but it includes a whole gang of organisms and processes that transcend our human needs of the place. The killdeer is at home in these human-modified habitats, and is a welcome, wild companion.